Model-based synthesis of distributed controllers for multi-robot systems is commonly approached in either a top-down or bottom-up fashion. In this paper, we investigate the experimental challenges of both approaches, with a special emphasis on resource-constrained miniature robots. We make our comparison through a case study in which a group of 2-cm-sized mobile robots screen the environment for undesirable features, and destroy or neutralize them. First, we solve this problem using a top-down approach that relies on a graph-based representation of the system, allowing for direct optimization using numerical techniques (e.g., linear and non-linear convex optimization) under very unrealistic assumptions (e.g., infinite number of robots, perfect localization, global communication, etc.). We show how one can relax these assumptions in the context of resource-constrained robots, and explain the resulting impact on system performance. 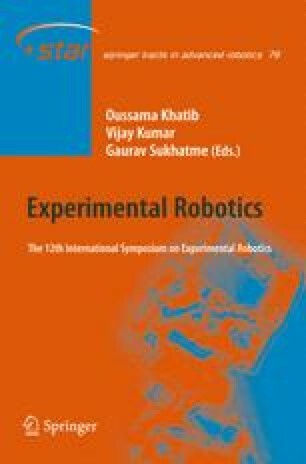 Second, we solve the same problem using a bottom-up approach, i.e., we build up computationally efficient and accurate models at multiple abstraction levels, and use them to optimize the robots’ controller using evolutionary algorithms. Finally, we outline the differences between the top-down and bottom-up approaches, and experimentally compare their performance.